638 pages | 14 B/W Illus. Neoliberalism is easily one of the most powerful concepts to emerge within the social sciences in the last two decades, and the number of scholars who write about this dynamic and unfolding process of socio-spatial transformation is astonishing. Even more surprising though is that there has, until now, not been an attempt to provide a wide-ranging volume that engages with the multiple registers in which neoliberalism has evolved. authors working at institutions around the world, the volume’s seven sections provide a systematic overview of neoliberalism’s origins, political implications, social tensions, knowledge productions, spaces, natures and environments, and aftermaths in addressing ongoing and emerging debates. The volume aims to provide the first comprehensive overview of the field and to advance the established and emergent debates in a field that has grown exponentially over the past two decades, coinciding with the meteoric rise of neoliberalism as a hegemonic ideology, state form, policy and program, and governmentality. It includes a substantive introductory chapter and will serve as an invaluable resource for undergraduates, graduate students, and professional scholars alike. "‘Neoliberalism is a slippery concept, meaning different things to different people’ (p. 1). Springer, Birch and MacLeavy’s excellently edited volume starts its mission with this nailing definition. Neoliberalism has become one of the concepts that one cannot avoid mentioning in analysing a recent development in social sciences. It is safe to argue that neoliberalism is now a term that is overly used even in partly overlapping and partly contradictory ways (Ferguson 2010: 166). There is not any easy way of defining what neoliberalism is. Is it a state form, or a policy, or a version of governmentality, or an ideology? Or simply, is it an epistemology? Perhaps, because of this nuisance, no scholar has attempted to provide an overview of this powerful but amorphous concept in a volume that engages with multiple registers in which the concept has evolved. 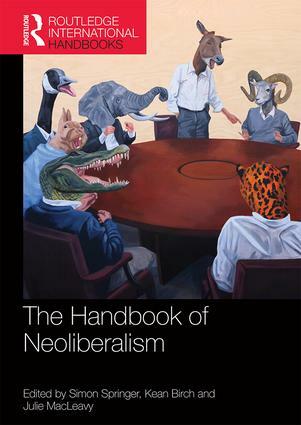 However, as the editors of this volume argue, neoliberalism is in need of unpacking because it serves as a way of understanding the transformation of society with new political, economic and social arrangements that emphasise market relations, re-tasking the role of state, and individual responsibility in the last few decades (p. 2). This volume represents the first attempt that contributes to the existing knowledge with an interdisciplinary and global perspective by advancing the established and emergent debates around the concept." Chapter 16: Resilience: A Right-Winger’s Ploy? Chapter 25: Education, Neoliberalism, and Human Capital: Homo Economicus as "Entrepreneur of Himself"
Chapter 27: Financial Economics and Business Schools: Legitimating Corporate Monopoly, Reproducing Neoliberalism? Simon Springer is an Associate Professor in the Department of Geography at University of Victoria, Canada. Julie MacLeavy is a Senior Lecturer in Human Geography at the University of Bristol, UK.